Maintenance activities, production processes, repair of equipment, technical services, security and surveillance companies, workshops, dismantling of facilities are likely to generate waste batteries. This activity converts the generator of the waste into a producer of the waste and is therefore obliged by law to take charge of the collection and correct management of this waste. Collection operations are conditioned by the composition, size, weight or condition of the batteries used in these activities, or a combination of all these characteristics. Ecopilas has specific channels for professional, industrial collection, adapted to the needs of producers and the most frequent technologies used in this type of products, also ensuring complete traceability of the collection and management of these batteries. Through Ecopilas you will be able to manage used batteries in an appropriate way, complying with current legislation, contributing to the improvement of the environment and at zero cost for your company. INDUSTRIAL BATTERIES (NI-CD, LEAD) ARE COMMONLY USED, BECAUSE OF THEIR RELIABILITY, IN LARGE INDUSTRIAL INSTALLATIONS, IN THE ELECTRICAL AND RAILWAY SECTORS AND IN OIL AND GAS COMPANIES. THEY MUST BE COLLECTED SEPARATELY AND FOLLOWING STRICT SAFETY PROTOCOLS, WHICH GUARANTEE THEIR CORRECT FINAL MANAGEMENT IN A TREATMENT PLANT, DUE TO THEIR POTENTIAL ENVIRONMENTAL HAZARD. THANKS TO THE AGREEMENTS REACHED BETWEEN ECOPILAS AND THE MAIN RECYCLERS OF LEAD-ACID BATTERIES IN SPAIN, WE ENSURE PROPER TREATMENT OF THIS TYPE OF WASTE. – Collecting any type of batteries and accumulators: Lead batteries, Ni-Cd accumulators, alkaline batteries, batteries containing mercury, Ni-MH, Lithium-Ion, Primary Lithium etc. – Coverage throughout the national territory with authorised managers in each Autonomous Community. 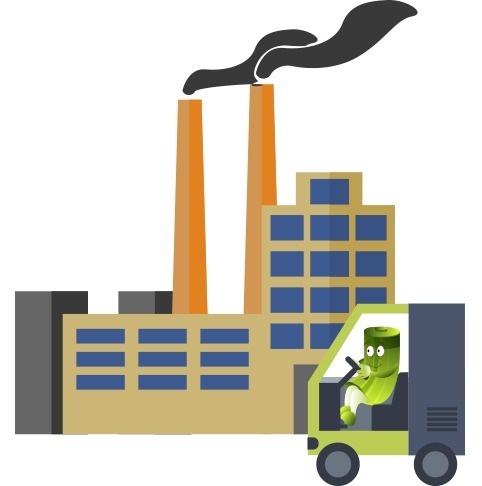 – Processing of requests on demand from a minimum collection of waste. – Possibility of establishing joint operations for the removal of waste batteries, electrical and electronic equipment (WEEEs) and lamps and luminaries through the ECOASIMELEC, ECOFIMÁTICA and ECOLUM Foundations. We will send you a questionnaire to find out your company’s needs and establish the most suitable collection operation. Make sure that the batteries you buy come from manufacturers/importers who comply with their obligations under RD 106/2008. As a consumer company of batteries, accumulators and batteries, make sure that all the purchases you make of these products come from manufacturers/importers registered by the Ministry of Industry (MINETAD) Register of Industrial Establishments, currently called RII-PYA. The producer or other initial holder of waste must ensure the proper treatment and transport of its waste and comply with the obligations established in Law 22/2011 of 28 July on waste and contaminated soil and Royal Decree 180/2015 of 13 March regulating the transport of waste within Spain.